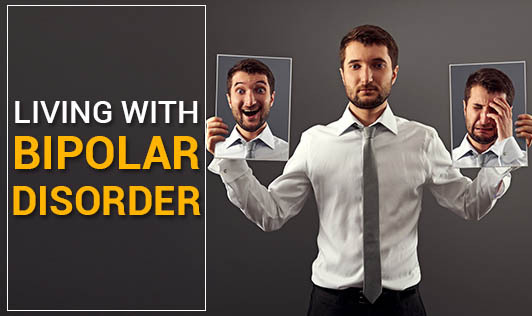 It's quite common for people who've been recently diagnosed with bipolar disorder to feel overwhelmed at the thought of having an illness. Some tend to even wait it out, struggling with several episodes before they begin treatment. Living with this disorder requires certain adjustments, usually starting with proper treatment, including medication and therapy. But there is a lot more that you can do to help yourself on a regular basis as the daily decisions that you make influence the course of your illness. Get involved in your treatment: Learn everything you can about bipolar disorder. Read up on the symptoms so that you can recognize them in yourself. Remember that the more informed you are, the better you'll be prepared to deal with the symptoms and make healthy choices for yourself. This also includes, taking your medications faithfully and being patient with the treatment process. Reach out to other people: You can turn to friends and family, join a bipolar disorder support group or build new relationships. Limit your contact with people who make you feel emotionally drained or leave you feeling discouraged. Having a strong support group is crucial for staying happy and healthy. Develop a routine: Your lifestyle choices, including eating, sleeping and exercise have a significant impact on your moods. Hence, it's important to keep a strict sleep schedule, eating healthy, socializing, exercising regularly as well as relaxing. Stress less: Stress can trigger episodes of depression and mania so keeping it under control is vital. Don't take on more than you can handle. Also, learn how to relax by learning relaxation techniques such as meditation, yoga or deep breathing. Avoid drugs, cigarettes and alcohol: Avoiding illicit drugs, nicotine and alcohol is an important part of recovery from episodes of manic, hypomanic or depressive symptoms as these can contribute to periods of stability. Be cautious when taking any medication: Some over the counter medication can be problematic for people with bipolar disorder. If you're unable to cope with the symptoms, contact your mental health professional immediately. Help is available, do not resort to self-harm!